Pathogenesis of the inflammatory bowel disease (IBD) involves the combination of immunological and inflammatory factors. IBD is associated with several extra-intestinal manifestations. The exact underlying bridge between the probable cardiac diseases in IBD patients is undetermined. Trigonelline is an alkaloid with several therapeutic potential properties. In this study, we aimed to assess the probable underlying mechanisms of this comorbidity as well as protective effect of trigonelline focusing inflammatory response and oxidative state in mouse model of colitis. Dextran sodium sulfate (DSS) was used for induction of colitis in mice. Trigonelline (10, 50 and 100 mg/kg) was administrated via intraperitoneal rout (i.p.) for 14 continuous days. Heart, intestine and serum samples were taken for assessment of total antioxidant capacity, malondialdehyde (MDA), gene expressions of inflammatory markers including tumor necrosis factor alpha (Tnf-α), interleukin 1-beta (Il/1β), toll- like receptor 4 (Tlr4) as well as for evaluation of histopathological alterations. Results demonstrated that trigonelline effectively attenuated the cellular/molecular and histopathological adverse effects of colitis in the intestine and heart tissues. In this regards, we found that trigonelline decreased the MDA level, attenuated the expression of Tnf-α, Il/1β and, Tlr4 as well as modulated the histopathological alterations in the intestine. Furthermore, trigonelline increased the antioxidant capacity in the related experimental groups. 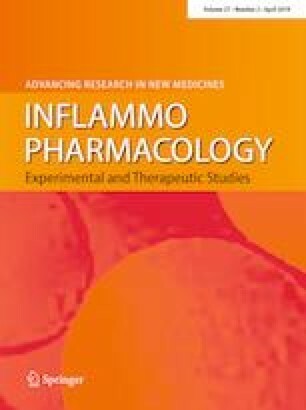 We concluded that IBD (colitis) is associated with comorbid cellular/molecular modifications in the heart and for the first time, we found that trigonelline has potential therapeutic effects (at least partially) to attenuate the cardiac manifestations of the colitis. This work was supported by a grant from Shahrekord University of Medical Sciences (SKUMS) with grant number of “2363”. The authors would like to thank Dr. Mahmoud Rafieian kopaei, Dr. Gholam Reza Mobini, Dr. Elham Saghaei and Mrs. Elham Bijad for their collaboration on this study.